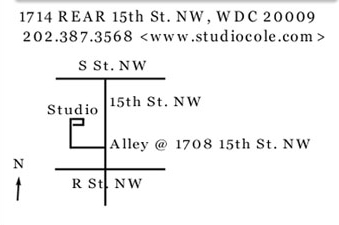 Robert Cole Studios is located in Northwest Washington, DC in a carriage house on an historic alley. The alley is just north of the corner of 15th and "R" on the left (west) side of the street opposite the Fifteenth St. Presbyterian Church. Fifteenth street is one way going north and "R" St. is one way going west. If you are driving, please park on 15th or in the vicinity. To get to the STUDIO, walk down the alley at 1708 15th St. The alley doglegs to the right. You will not miss it!